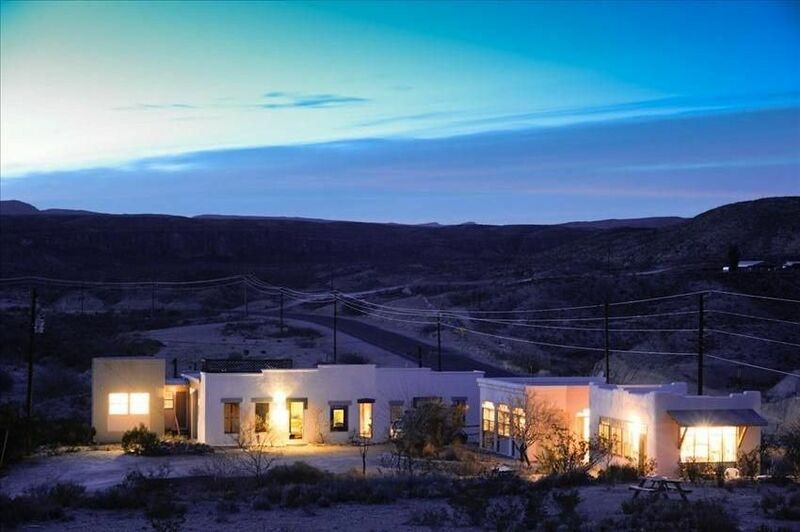 Terlingua House is located in the heart of the desert mountain country of West Texas. For the price of a nice single hotel room, this unique guesthouse is like having your own personal lodge for your trip. It is a three-bedroom, two-bath, adobe-style property with full kitchen; each located in a separate building. This unique layout enables you to socialize and dine together and retreat to the privacy of your own separate rooms for some solitude. It's almost like renting a small resort rather than just a vacation home or hotel room. * Fully stocked kitchen with full sized fridge, stove/oven (apartment sized), microwave, dishwasher and all the dishes, utensils and cooking requirements one would need. * An outdoor sitting area with fire pit (bring your own wood). Stroll up the hill on the property and view the changing colors of the Chisos Mountains during the spectacular sunrises and sunsets. We find this property most comfortable for 6 people - 3 bedrooms, 3 couples. We have arranged the bedding so that we can accommodate up to 12 in beds and 16 if you count the futon and day beds in the kitchen. Note that there is a price increase beginning at 7 or more guests age 10 or over. Value - For two guests this entire property is about the price of a nice hotel room in the city, if you are not on a strictly tight budget, you will be happy you are here. Dining out is expensive in the area, If you make use of the kitchen at all, you will likely find this makes up the difference. For four or more people you will find this is by far the best value in the area. You are on 15 acres, great views, TV, Internet, fire pit, great upstairs deck, city water, direct access to TX 170 highway. You are NOT confined between the tents, trailers or pre-fab "cabins" that have popped up in the years since we began this project. As they say, location is everything - we have a great location, all the amenities and reasonable pricing. Terlingua House is located two miles west of Terlingua, Texas between Big Bend National Park and Big Bend Ranch State Park. This safe and secure 15 acre, semi-secluded property with easy access, has a grand view of the Chisos Mountains of Big Bend National Park while still being only minutes away from restaurants and local river rafting, hiking, biking and jeep tour outfitters. Terlingua Ghost town is a couple minutes drive down the road. There's even a pizza place at the bottom of the road - an easy walk for dinner and drinks. If you like Big Bend I am confident you will like Terlingua House. We strive to keep it cool, fun, functional and clean. After 14+ years we have many repeat customers, many recommendations and about once a year - a whiner! If you have never been to Big Bend, it is truly one of the most unique and fascinating areas in Texas, and the country for that matter - hence the national and state parks. It is also one of the most vast and remote areas in the country. It is - an adventure. Whether you stay with us or one of the other lodging accommodations in the area, go with the understanding that you will be, and we are working in, an area that teeters between the 21st century and the 19th century. This is part of the fun, part of the adventure - part of the allure of Big Bend. ** IMPORTANT NOTE: VRBO Instant quote does not calculate our specials correctly. A 'rent 2 get 3rd free' special means you have to rent two nights to get the third free. Unfortunately VRBO calculator will average the price across all nights and it results in a discrepancy. For a true quote please contact us directly. Thank you and sorry for any inconvenience. The same applies for 'rent 2 get 2 free'. Also note that there is an additional per person charge for groups over 6. When you make your reservation on VRBO/HomeAway, 100% is non-refundable if canceled but will be saved as a credit for a future stay. This credit does not expire. If something happens that you can’t make your trip, please contact us and we will make every effort to accommodate your needs. There is no refund of rent for late arrival or early departure. Thank you for considering Terlingua House for your Big Bend trip. Bud Johnson and Friends are the owners of Terlingua House. Bud lives on a ranch just outside of Bronte, Texas (between San Angelo and Abilene). He is a geologist by trade and also dabbles as an entrepreneur. I fell in love with the area and then the property back in the 80's and it has been a labor of love to get it to the high standard that it is today. There's something almost magical or spiritual when you watch the sunrise and sunset from here - not to mention the star gazing on a clear night. There's nothing like it. Terlingua House is a deluxe property on 15 acres with spectacular views, easy access, all the amenities and plenty of water. Both water and access can be an issue in the area. It's the perfect place to get away from it all and experience an amazing part of Texas that many don't even know exist. It's just minutes from shopping, dining and tour outfitters and easy access for day trips. Plus, you're fully connected to the outside world here with Internet and satellite TV. Unique, lodge-like adobe style buildings house 3 separate sleeping quarters and kitchen/dining area. It's like renting a lodge or small resort for the same price as a decent hotel room. This allows you to socialize, dine and entertain as a group with the added benefit of retreating to your own space for some quiet time. Just minutes from shopping and dining, it's a perfect place to get away from it all but still be connected with wireless Internet, satellite TV other comforts of home. The sunsets/sunrises and star gazing are spectacular from this property. Very Rural but easy access. The view of the Chisos Mountains are great! Each room has an individual central heating and cooling unit - works great! (2) 2 stackable washer and dryers units. Plus front loader located in kitchen area. Direct TV. Can't miss the football games! Great for sunrises and sunsets! (2) Upstairs and main floor decks. Terlingua House is a great location to explore Big Bend NP. The house is spacious and the seven in my group had ample space. The bedrooms are very spacious. We had a very good time in Terlingua. Oh My Gosh, everything was perfect!! The house was amazing, the beds were so comfortable, the fire pit was fantastic......We had everything we needed. We will come back & tell everyone we know about our stay. Thank You, Terlingua House!! We had a great time. The house is well appointed and comfortable. The kitchen is well-equipped. The location is perfect with access to both the national and the state park. I’ve stayed there many years and every year it gets better. Great get-away HQ for our family trip. Loved the layout - it worked great with our older kids. Very easy booking and arrival/departure experience. Would definitely stay again! Wonderful location and perfect for our group. The kitchen is the best. Wonderful location and the night fires were the best. Great location for exploring Big Bend! We had a great time at Terlingua House! The house was perfect for our group of 8. There was everything we needed for our stay!